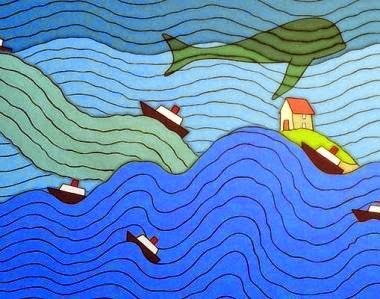 Cerita Inggris Indonesia: Why the Sea is Salt - There were two brothers who lived in a village by the sea, the elder was called Chi Hua and the younger Chi Ming. When their father died. Chi Hua took all the family property for himself. His brother had nothing. Chi Ming was poor and worked hard every day to collect firewood to make a living. One night, he had a dream. In this dream, an old man came to him. “I am the god of stone,” he said. “I want to help you because you are honest and hard-working. If you will climb to the top of the mountain behind your village, you will find a stone gate there. Open the gate and go inside. The next day, Chi Ming climbed the mountain. He carried a basket of food with him. When he arrived at the stone gate, he went inside. He found himself in a large cave. There were many fairies living there. However, they did not have enough food to eat. He gave them the basket of food and they were very pleased. “You can take away all the gold and silver you can carry.” They said to him. “Please give me instead the magic grindstone,” Chi Ming asked. The fairies handed over the grindstone to him. Chi Ming thanked them and carried it away with him. When he returned home. He felt hungry. He asked the grindstone for some food. In no time, a wonderful meal appeared on the table. From that day on, everything he wanted was given to him by the magic grindstone. Not long afterwards, his elder brother, Chi Hua, heard of Chi Ming’s good fortune. While Chi Ming was sleeping he crept into the house and stole the magic grindstone. He sailed away in a little boat with the magic grindstone. He then asked the grindstone for the salt, “All right,” said the grind stone.it started grinding away and the boat soon filled with salt. There was alt everywhere. But Chi Hua was so greedy that he did not want to tell the grindstone to stop. Finally, the boat sank under the weight of the salt and Chi Hua was drowned. From the day on. The grindstone continued to make salt at the bottom of the sea. That is why the sea is so salty.